Like its pricey stablemate, the BMW M3 Convertible, the latest Mini Cooper S drop-top can put a smile on your dial while you get a 200km/h tan. Two years after the launch of the R57 version of the Mini hardtop, the BMW-owned brand is set to launch the long-awaited Cabrio range with a synchronized global release on Saturday March 28. The Cabrio pair - sold with a choice of atmo Cooper and turbocharged Cooper S models - inherits all the technical and styling features of the current hardtop, plus the electric soft-top roof and single-piece electromechanical rollover bar behind the rear seats (which only pops up on demand, in 150m/s!). Both models are available with the geared-up $3600 Chilli package, which accounted for 65-70 per cent of outgoing Cabrio sales. New more powerful engines, substantial reductions in fuel consumption and emissions, enhanced safety technology, suspension tuning and a sense of practicality amidst the predictable chic, fashion centric approach, are evident in the latest Cabrio. It's an important variant for Mini, as the Cabrio tends to represent around 25 percent of the range's volume. Coming soon too in this 50th anniversary year for Mini is the Cooper D (for diesel...doh! ), claimed to the most fuel efficient car currently on the market (3.9L/100km), and with the lowest C02 values. It will be priced from $33,750. Priced from $39,800, the Cooper Cabrio is powered by an 88kW 1.6-litre four-cylinder engine with fully variable valve management based on BMW's Valvetronic technology, which aims at an optimised torque curve and best efficiency. The regular Cooper Cabrio accelerates to 100 km/h in 9.8 seconds with an average fuel consumption of 6.1L/100km and CO2 emissions now reduced to 145g/km. That's approximately 16 percent less than the previous generation Cab. That's about all we can say about the entry car at this stage, as we didn't get to drive it at the press launch. But the version we did drive, the Cooper S Cabrio manual with the strong 128kW 1.6-litre four-cylinder engine with twin-scroll turbocharger and direct fuel injection proved to be a genuine amusement park - even though the Victorian weather did its often-unpredictable thing. But the optional ($490) heated front seats were a bulwark against the cold as we accepted the challenge of motoring with the lid down in drizzle and 18 degree autumn weather. The quality traditional soft top with its integrated sliding roof function folds back automatically in a complete finger-on-button process within just 15 seconds, at speeds up to 30km/h. With the roof raised, over-the-shoulder vision is limited but the rear window visibility is much improved over the superseded Cabrio thanks to the new (lower) rollover protection. The Cooper S (from $48,000) is remarkably responsive in all gears, pulling comfortably from as low as 2000 rpm but really getting with it from 3500. The official zero-to-100km/h time is 7.4 seconds, accompanied by some familiar (from the good days of the original brick) wheel-tugging torque steer. And, boy, I do like the lovely shift action of the manual 'box and the tactile steering. Regardless of any suspension fiddling, the ride is still on the firm side, a trade-off for its kart-like handling. Impressively, the latest Cooper S Cabrio only consumes 7.2 litres per 100km and CO2 emissions have been reduced to 171g/km (or approximately 18 percent less than the previous generation). Along with the expected front side and curtain 'bags, stability control and ABS, automatic air conditioning with Cabrio mode is available for the first time, setting out to provide a consistent set temperature when the roof is open, regardless of wind velocity. Also available is a handy integration of external music players, a USB port and Bluetooth hands-free telephone system. 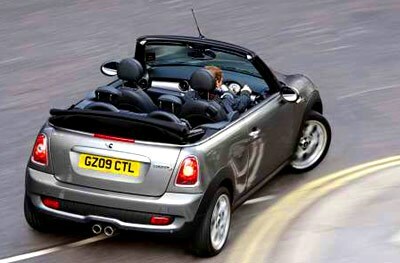 Drop tops inevitably compromised boot space, and this is true with the Mini Cabrio. But this model is better than the last one. With the rear-seat backrest folding down individually on either side, as well as the rear through-loading between the cargo and passenger compartment, luggage compartment capacity has increased to 125 litres (up 5 litres) with the roof open, 170 litres (up 5 litres) with the roof closed, and 660 litres (up 55 litres) with the rear-seat backrest folded down. An optional six-speed automatic transmission is available in all models for an additional $2350, and there are 12 colour variants available.